WOBURN, Mass. – Oct. 16, 2018 – Jobiak, provider of the industry’s first AI-based recruitment marketing platform specifically for Google for Jobs, today announced the launch of its flagship platform for recruiters and talent acquisition teams to directly publish their jobs to Google for Jobs. Now, in just three steps, users are able to directly access candidates on Google for Jobs, accelerating candidate flow and reducing the cost and time to hire. 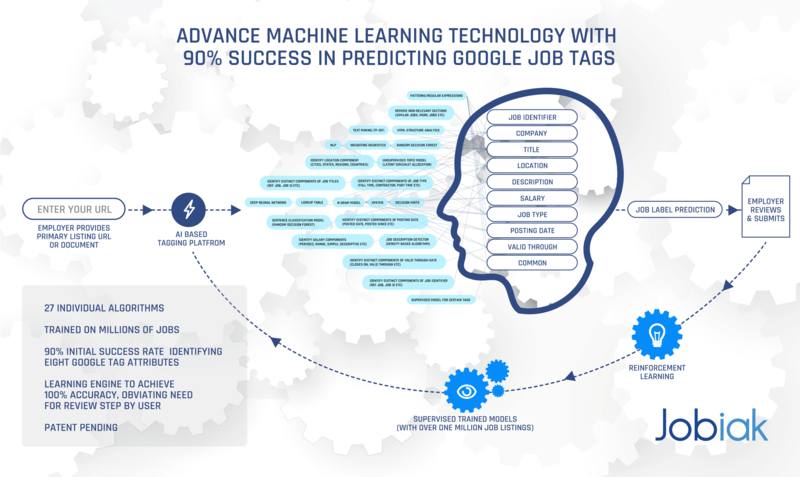 Jobiak provides the industry’s first AI-based recruitment marketing platform that is designed to quickly and directly publish job postings to Google for Jobs, maximize their visibility and accelerate the flow of qualified candidates. Created for recruiters, talent acquisition teams and HR professionals, Jobiak offers the fastest and most direct path to posting jobs on Google for Jobs with “three clicks to publish,” all without the need for HTML coding or developer support. Jobiak is headquartered in Woburn, Mass., with international offices in India. Follow on Twitter @jobiak_ai.